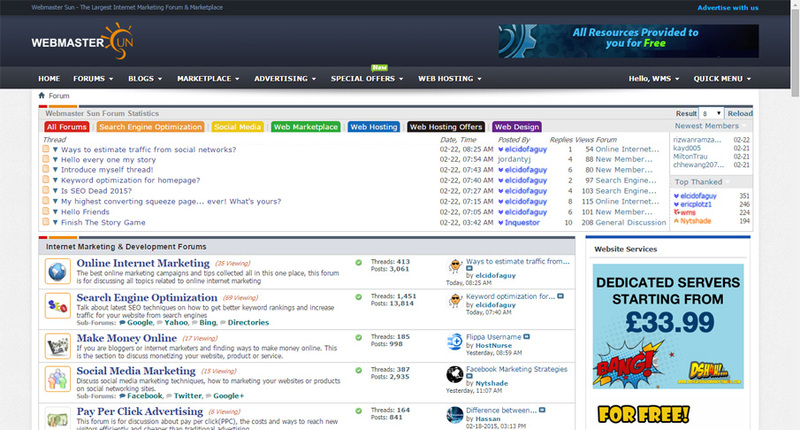 Please review my SEO & Internet Marketing Forum, Domain is about 1 years old. Purpose: WebmasterSun.com is a marketing forum for the webmasters all around the world discussing about SEO and Internet Marketing Online. Goals: The main goal of the forum is to become one of the most popular SEO & Internet marketing forum in the world for webmasters and internet marketers. Plugins: It used Custom Meta Tags, Advanced Post Thanks / Like, Advanced Forum Statistics, Everysidebar plugin. Last edited by webmastersun; Sun 22nd Feb '15, 12:11am. Just added a screenshot on this post so all of you can view it from here easily. Congratz! you did a great job! I like your forum statistics, can I know the Mod name? I dont like the logo you should get a new logo from design contest site. please show me reasons why and which ways I should apply for my logo design to make it professional? Have you considered upgrading to vb5? I understand that vb4 is actually perfect for a marketing forum. Though I feel as if you could do better with vb5. Especially with 5.1.4 on the way with the 3 column layout. Pls go here to see how good logos look like. Your logo I am sorry is childish and not professional look, I can re-make it in less than a minute. But I am not a logo artist but I know if the logo is good or not, easy to make or not.My advice would be to open a contest there you will get good logo, guaranteed. Last edited by napy8gen; Sun 19th Oct '14, 7:05am. I like the current logo. I like the overall design of the site. Since you have custom forum icons, I think it would be nice to have some custom thread icons (on the forumdisplay pages). I think the text is a bit large in places (like in the threads/posts and also the thread titles on the forumdisplay pages). But, I like the colors and font. Ps: I tried to replace vB5 icons for my forum as Lynne suggested, Look great! Last edited by webmastersun; Tue 21st Oct '14, 3:49pm. But I am not a logo artist but I know if the logo is good or not, easy to make or not.My advice would be to open a contest there you will get good logo, guaranteed.. If you can make any logo concepts for my forum logo, please show on this thread, if they are better than current my one, I am ready to pay for your logo. Yes I agree. I am having trouble finding mods for vbulletin 5. Maybe if the coders step it up you'll see differently. I do like your site though. I'm trying to make my own site impressive on vbulletin 5 so that other members will feel like buying it once they see it. It's nothing right now though. I'll let you know when it's ready and you can also let me know what you think. Yeah I agree with you. Vb5 has some disadvantages and less mods so I couldn't use it for my site. You will need more effort if you want vB5 look more impressive from your visitors.